I love the gratitude point! I am constantly grateful for the muse flashes I receive! 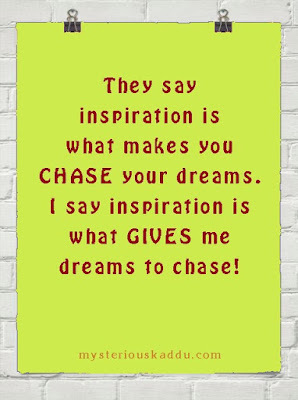 Chicky, Your quote about inspiration is quite true, it's inspiration that makes me chase my dreams. I had never looked at it that way until now. And, that's precisely what I did this time with the challenge, I chased my dreams with my Art Sketching Through the Alphabet series and I hope you'll inch your way over to my site for today's alpha-prompt "I" for Iris with "Curious as a Cathy". Happy a2zing! Those are some good things that give your inspiration. For me, it can be nature, quiet time to reflect, reading, and deep and meaningful conversations! I goofed on my signature, please use this one...Art Sketching Through the Alphabet Letter "I" for Iris! I'm sorry about that! Anybody who keeps discovering new, creative ways to solve the challenges in his line of work. This is what makes me enjoy my work.I detest boring.Work if not fun is not good for health! One of the things i constantly tell my children is that whatever you do, do it with love because then you feel inspired and creative. We are on the same page on that one. Inspiration definitely leads to happiness. It pushes us to do things and enjoy the process. Nothing we do without inspiration can be fun! I find my inspiration in Pinterest and Instagram... yeah I know, sounds weird, that's where all my inspiration lives. And then comes a couple of people in real life. :) Some of the best ideas come in the shower too. I think as writers we are constantly in need for inspiration! 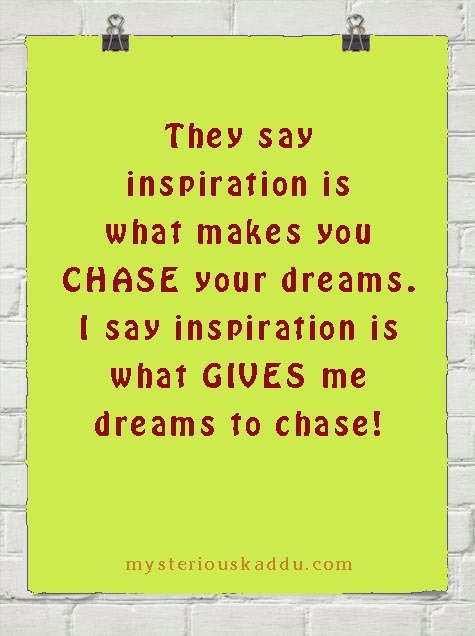 This post succinctly covers how to get inspiration! but most of all I liked the points under why we need inspiration. I agree with all of them and the mindfulness point, even more. Indeed inspiration leads to happiness. When we got stuck somewhere, our role models struggle inspire us to move forward. Loved your inspiration post, Chicky and how connected all your blog posts are for this challenge. Inspiration keeps me going to fuel my creativity and makes me feel more alive than more mundane activities like housework. When I'm fired up with inspiration and creating, I cease to notice anything else. Good to recognize that inspiration is not just for creative, dreamy types and is there for all if we only embrace it. Great thought provoking post, Chicky! Happy A to Zing to you, too! Inspiration keeps me going! If there is no inspiration around me, I wonder what am I going to do with my life?! What inspires me... reading, talking to friends, introspection, a well rested mind and body (I cant think straight when I am tired). I agree inspiration is not just about creative types. Inspiration to do mundane things gets us through the day. This post is inspiring. I believe that all bloggers need inspiration to post. I am the inspired by problems type. I find inspiration in everything and keep learning something new all the time. Nice I! I can't imagine my life without inspirations. I am a product of being inspired by multiple people and adapting their qualities. Great post, Chicky. I used to be a voracious reader some 6 months earlier, with loads of works now I am trying to breathe some air every evening, a walk and a talk with myself. Oh yes, Sanchie... I forgot nature. That also goes in my list! True, Amrita. There is no fun in doing the boring. No learning. No inspiration. That's true, Suzy. Love does inspire us. It "pushes" us! Exactly, Swathi! Hahaha! Raji, I haven't yet got a hang of wither of those two. Even Twitter, I guess! :P I'm ancient! True, Debbie. It takes just a moment to kindle that spark of inspiration. Thank you, Dr. Bushra. It sure is useful to have a few strong role models. I do that too, Cathy! I just become hyper-focused or something, you know! I'll try to make an ebook out of this series eventually. So trying to keep everything linked, to make it a more cohesive reading.